Civil rights, family historical fiction, and the '60's often catch my attention. Tuck aptly connects the brutality of the life as an African-American teen in hate-filled Greenville, NC with the hope of playing a role actively. 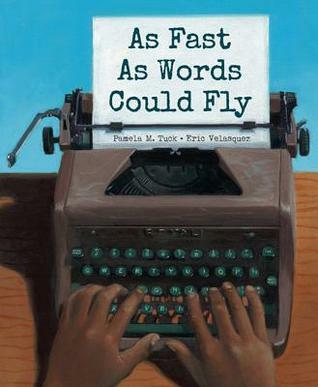 Main character Mason (who happens to be the author's father) engages with the civil-rights movement through writing and being one of the first students to integrate a previously all-white school. His writing and typing skills so well developed, he becomes the school representative to the local typing tournament. I applaud the author for naming some pretty ugly examples that her father had to live through by going to school where he was hated for the color of his skin. I greater applaud her for telling such an important and unique story. This one was completely new to me, and I loved it. I can see using it with young learners and older, all who are focusing on civil rights in the U.S. I'll be honest: I have no idea what integrating a school feels like, to actually summons the courage to walk in those halls and into classrooms with such bravery, presence, intent. I know what terror feels like from some experiences in my own life; I can only imagine the intersections between our very different experiences. I have great respect for the people who have indeed walked through their own fear, and this story represents one such example. Thank you, Ms. Tuck, for telling us the story of these very important set of moments in history. How sweet to hear from you, oh author of fabulous book! Seriously I love it when authors read these posts. It feels so important to lift up great stories to a wide audience, and while I talk alot about books in my class, I feel this blog is one more place to share the wealth. And this book is one of those wealth-y ones to me. It is an honor to offer reviews of books that move me, and this one did. To have you write us, Ms. Tuck, just adds more honor to that. Thank you, thank you! !